A personal trust is designed to provide protection to wealthy and affluent investors to ensure their assets are eventually distributed according to the investor’s wishes, usually with the target of reducing disbursement conflicts and tax obligations. Currently, the number of wealthy people in America is increasing, reaching a record 10.8 million Americans with a net worth of $1 million or more, according to Spectrem’s Markets Insights 2017. There are more than one million people with a net worth over $5 million, another record. And yet, the number of managed personal trusts continues to drop, according to Spectrem’s 2017 Comprehensive Bank Trust Update. In 2016, the number of personal bank trust accounts held in trust institutions dropped to 571,044, the seventh consecutive decrease and the largest by number since 2011. At the same time, the total personal trust assets fell for the second year in a row to $892 billion, the lowest level since 2012. 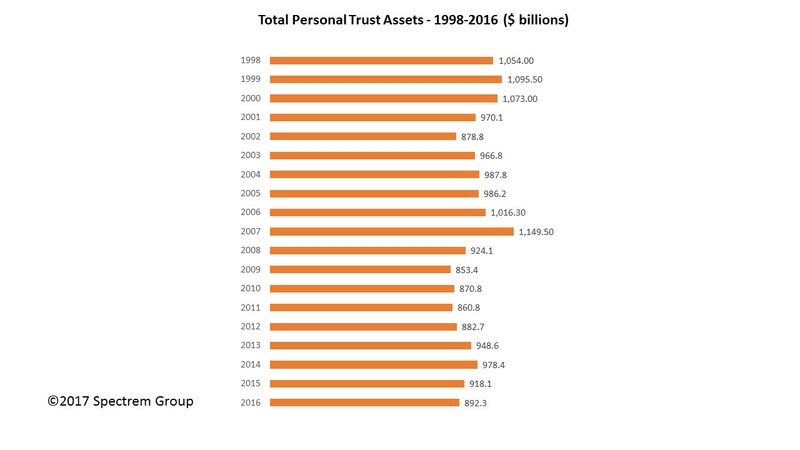 The total personal trust assets is slightly above the low mark of the century; in 2009, there were $853 billion in total personal trust assets. But in terms of number of accounts, the new total of 571,044 is more than 200,000 below the total of 789,950 in 2009, just before the stock market crash took effect on the long-term personal holdings of investors. These numbers remain problematic for management in bank trust departments whose sole purpose is to serve as trustees for personal trust accounts. Spectrem’s recent study of trust holders – Choosing a Trustee - indicated the concern investors have in corporate trustees, most often worrying about a connection between the investor and the trustee about plans for the money long-term, as well as staff turnover in trust departments creating issues related to the relationship between the investor and the bank. It is not just corporate trusts which are taking a beating. The number of non-managed personal trust accounts continues to dip, and in 2016 hit 54,032, more than 30,000 less than the 2003 total of 89,580, and less than half the 127,000 held by self-trustees in 2002. Understanding why investors avoid a corporate trustee could help an advisor when it comes time to discuss the trust decision with an investor. Demonstrating that an investor can self-trustee with the advisor managing the assets could make the decision to hire that advisor easier to make. Advisors working with trust assets perform a balancing act based on both the immediate and long-term needs and demands of the trust grantor and the beneficiaries. The grantor will keep a close eye on the trust assets will want to see some growth but with a goal of immediate income and younger investors will want to see a more long-term aggressive attitude toward investments. Despite the low level of corporate trust utilization, opportunities exist. As investors age, they are more willing to rely upon others to manage and protect their assets. Many do not feel their children are ready to manage the trust or they may be unwilling. They worry that their trusted advisors may not be around in the future. In these cases, trust providers have an opportunity to develop relationships with these individuals and their families. These relationship must be developed at a multi-generational level so that the beneficiaries feel comfortable with who they should contact in the future. Trust organizations need to update their communication methods to meet modern standards but balance those methods with old-fashioned face-to-face meetings. Trust organizations must be able to communicate and provide information immediately via these channels, but they must continue to hold personal meetings to develop trust-based relationships.